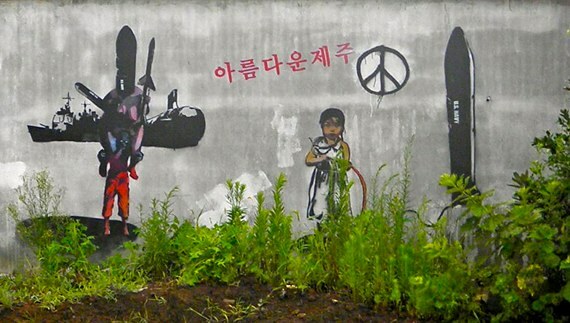 Graffiti on Jeju Island, via savejejuisland.org. These guys are no joke. Tarak Kauff was a paratrooper in U.S. Army. Elliott Adams was in the infantry as a paratrooper in Vietnam, Japan, Korea and Alaska. Mike Hastie was an Army medic in Vietnam. Now they are all members of Veterans for Peace, and they just got kicked out of Jeju Island in South Korea. The issue is no joke either. The United States and South Korea have teamed up to build a huge naval base on the beautiful, pristine island of Jeju — a bio-region so unique that UNESCO has identified nine different geological sites there as “Global Geoparks.” In the midst of this natural wonderland, the two military powerhouses want a deep-water harbor for the nuclear-armed Aegis destroyer and other ships that can menace China and protect Washington and Seoul’s strategic interests in the region. The base will be part of the ever expanding U.S. military/economic global hegemonic plans to have a potent strike force directly off the coast of China. The U.S. has been an occupying force in South Korea since WWII, consequently imposing it’s political/economic/cultural and military will on the Korean people, this being just one more example of that. To get an idea of how violent and aggressive this is, imagine China or Russia building a naval base complete with missile carrying destroyers, say in Bermuda or Puerto Rico. The resistance has been strong for seven years, ever since local people learned of the plans to build a port large enough for 20 battleships in their backyard. But international attention has been focused on the village of Ganjeong recently because, on March 7, 2012, the South Korean navy and Samsung started blasting out rock foundations along the coastline. This work is expected to last for the next five months and use 43 tons of explosives. Jeju Governor Woo Keun-min issued an official request to the South Korean navy to halt the blast of the sacred Gureombi volcanic coastline on Jeju Island, but he has been ignored. The day after the blasting started, hundreds of people arrived on the island to engage in nonviolent resistance against the navy’s blasting. Activists have been lying in the road to stop construction vehicles, protesting peacefully and pressing their local and national legislators. There have been many arrests and activists have been handed heavy fines. Tarak and the other Veterans for Peace did not get even that far. Immigration officials met the three of them on their plane when it landed on Jeju from Shanghai, China. They were detained, told they could not enter Jeju and put back on a plane to China. [We] stand in solidarity with … all peoples worldwide, who are standing up courageously, leading and often dying in the struggle for equality and justice as they are exposed to massive state run police and military violence. What touched me as a trainer was how aware the veterans were of stepping into harm’s way. We use that rhetoric in training and we role play hassle lines and other confrontations as a way of preparing people for the possibility of nonviolently encountering violence. But this was a room full of people planning to stand in front of police batons and say, “No, this is wrong,” and to use their position in society as veterans to absorb and expose the brutality of the state. The show of force that the Peace Team was up against in Jeju has been extreme. In preparation for blasting to begin, South Korea sent hundreds of extra police to the island. Local activists estimate that between the indigenous police force and the mainland forces, there are now about 1,500 heavily equipped police in the village of Ganjeong — making a ratio of one officer for every villager. The Chinese people on the plane were hostile and disrespectful towards us. They had been kept waiting for three Americans, they thought we were spies or something. It went on for a while and finally one guy was just totally offensive. I turned and explained to him that we were American military veterans, trying to get to Jeju to protest the U.S. and South Korean Naval Base being constructed there — abase that will be a threat to China. Well, everything changed and they were respectful and nice to us the rest of the way. Back in the Shanghai airport, immigration officials held on to their passports and got them on an American Airlines flight back to Los Angeles. In the course of all of this it became clear that American was going to charge them $280 each to change their tickets. “Well, this would have added insult to injury,” Tarak says. “I explained to the supervisor — a Chinese woman — why we were forced to change our flight, and she waived the fees.” They did not get where they wanted to go, but they were able to reach out to lots of ordinary Chinese people with this message of international solidarity. It was likely the first time the Chinese had encountered U.S. peace activists. Angie Zelter is accused of breaking into the construction site in Gangjeong Village on the southern tip of the resort island Friday evening after cutting down barbed-wire fences. … Meanwhile, French activist Benjamin Monnet allegedly trespassed onto the site and climbed a crane on the same day. The South Korean military and police forces went to great lengths and considerable expense to prevent U.S. veterans from standing side-by-side with priests and nuns, villagers, students, monks and other international activists on Jeju. “U.S military veterans resisting the naval base obviously has significance,” says Tarak. The veterans are now back in the United States, jet-lagged and exhausted after their ordeal, but they are not giving up. They protested at the South Korean Consulate (335 East 45th Street, between First and Second Avenues) in New York City on Friday, March 16 at 12:30. If you couldn’t join them there, consider calling the South Korean embassy in Washington DC 202-939-5692 or 202-939-5600 to lodge a strong complaint about the denial of entry of three VFP members entry to Jeju Island. For information on upcoming Peace Team trainings, email Elliott Adams. Thanks for being so brave and committed to Justice; you are my heroes! what about the massive human rights violation in North Korea!!! Did you also campaign for halil food at the Olympics? WNV heads to New Jersey!